While Etienne constructed our wedding website last night, I transformed some hand-me-down micro-fleece thermal pants my brother Cassady gifted me last fall into some cool running tights. Cassady is a sommelier at the Norman Hardie winery during the summers and enjoys shopping at their local Giant Tiger. Hence my heinous gift. 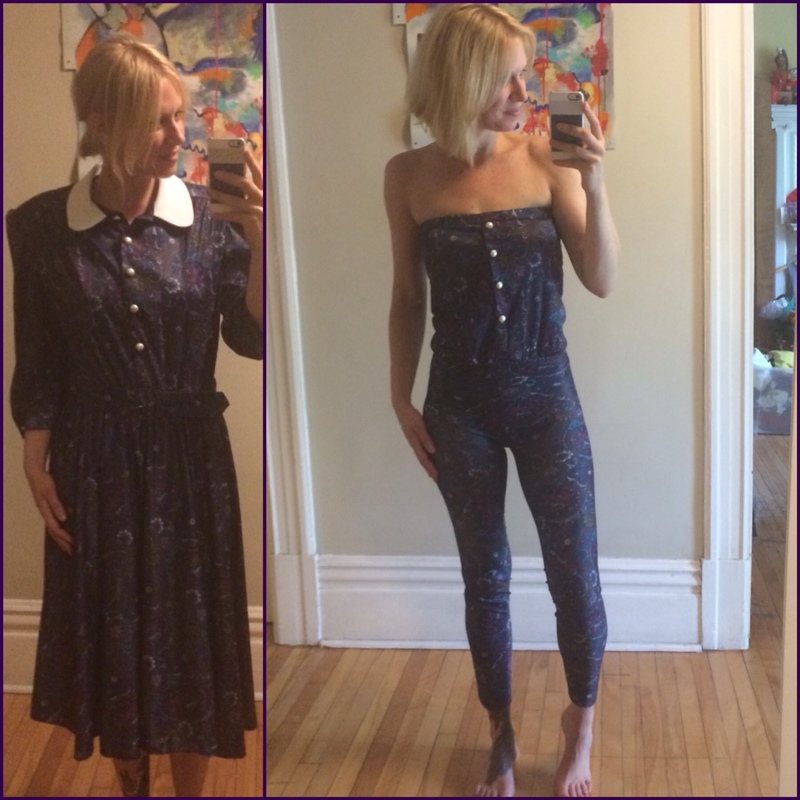 I refashioned the top to this stunning Ducks Unlimited Canada hunting sweatsuit last December into a tunic/minidress but wasn’t confident in my pants-making abilities at the time to attempt anything with the bottom of the outfit. 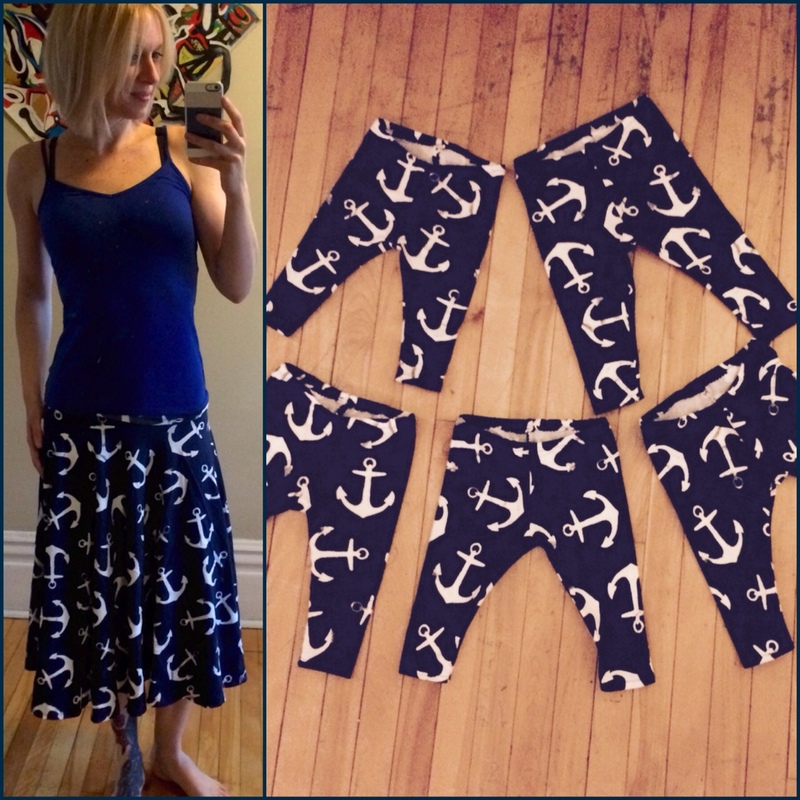 That all changed when I took a legging sewing class with Heather Lou last month and learned some fun new skills. 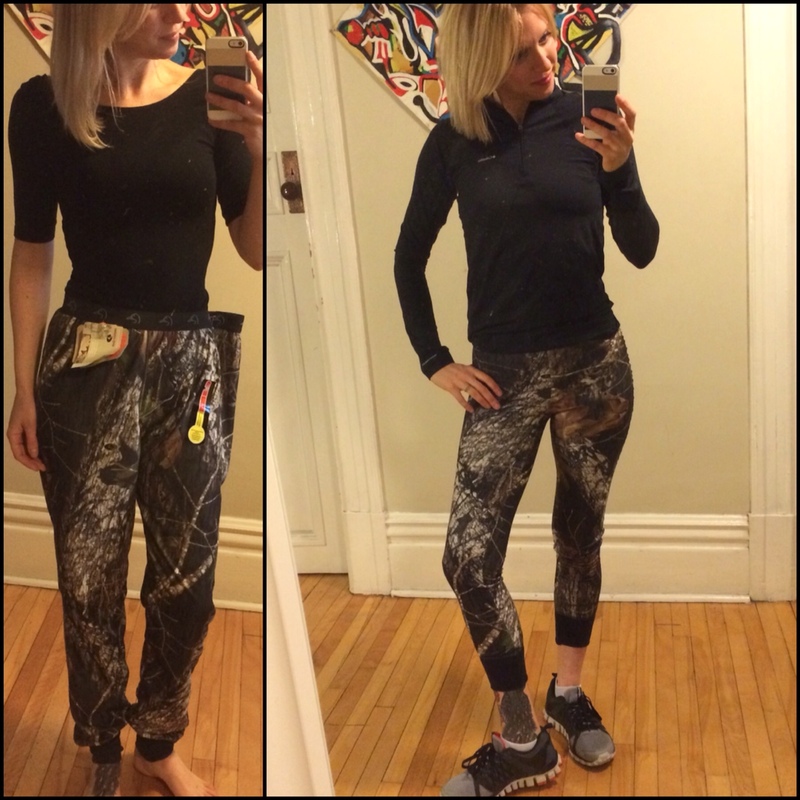 I up-cycled these large mens camo sweatpants in some pretty (tight) running pants. The fabric allows for just enough stretch for them to work as running pants. Perfect as I prep in this extended winter of ours for the Montréal half-marathon! A little creativity + a little light snow + the espresso leggings pattern by Cake Patterns = And voilà, fantastic cosy running pants! My Bowie Pants! 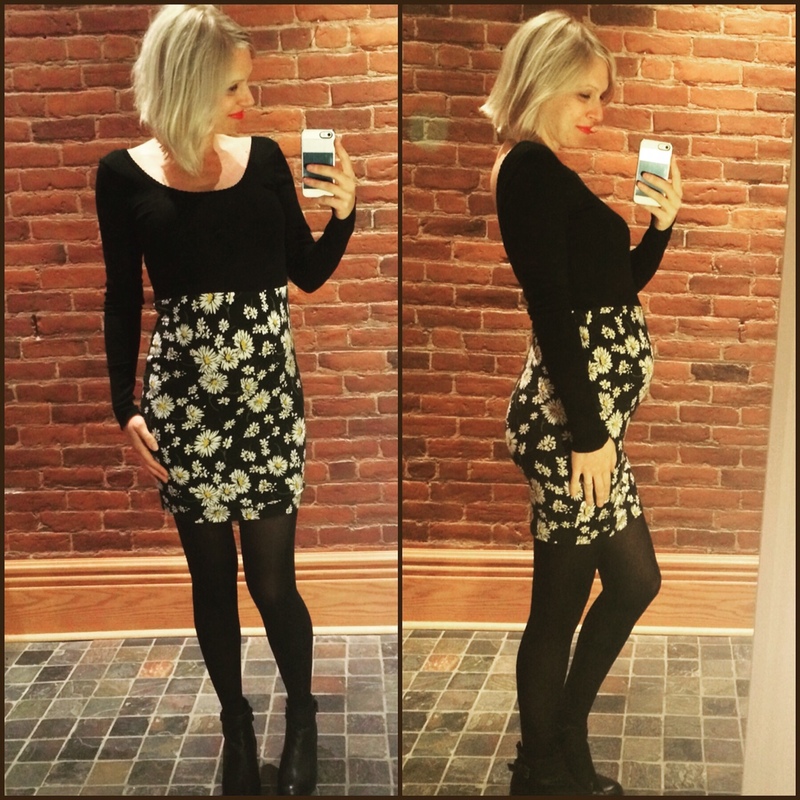 This past month, I had the opportunity to learn how to make made-to-measure leggings from the lovely & talented Montreal based designer, blogger & sewist, Heather Lou. Heather hosted a two weekend- Sunday afternoons for 3 hours each- DIY legging workshop at Fripe Fabrique, a boutique and do it yourself atelier. (Psst, they also sell online). Michelle, FF’s owner, has a beautiful set of Singer sewing machines for her sewing DIY workshops. After the shop had closed, Michelle transformed her adorable boutique into the perfect studio space for us to learn about knits, measuring ourselves to create our own pattern and make made-to-measure leggings. Heather began by taking us through the basics. This was especially fun for me as I have never taken a proper sewing class. I had the opportunity to ask all sorts of questions. I discovered a slew of things I’ve been doing incorrectly when it comes to working with knits and stretchy fabrics. I have been using the wrong needle (ballpoint or stretch needles only), that I must invest a couple of my pennies into a walking foot, how to properly gauge the stretch content a given fabric and what is a “grain-line”- just to name a few. Heather also shared a video with us on how sewing machines work- mind-blown! We measured ourselves and plotted our measurements on the pattern. We used Cake Patterns Espresso leggings N5555 – a genius design as it really takes into account how we are of all different shapes and sizes. Aside from the usual measurements of waist, thigh circumference and leg length, we measured our front and back rises-these are key measurements to creating the perfect fitted legging. I made mine using a 4-way stretch gold polyester with 5% lycra. And voilà, I call them my Bowie Pants! The Tashenka Garden Party Dress. 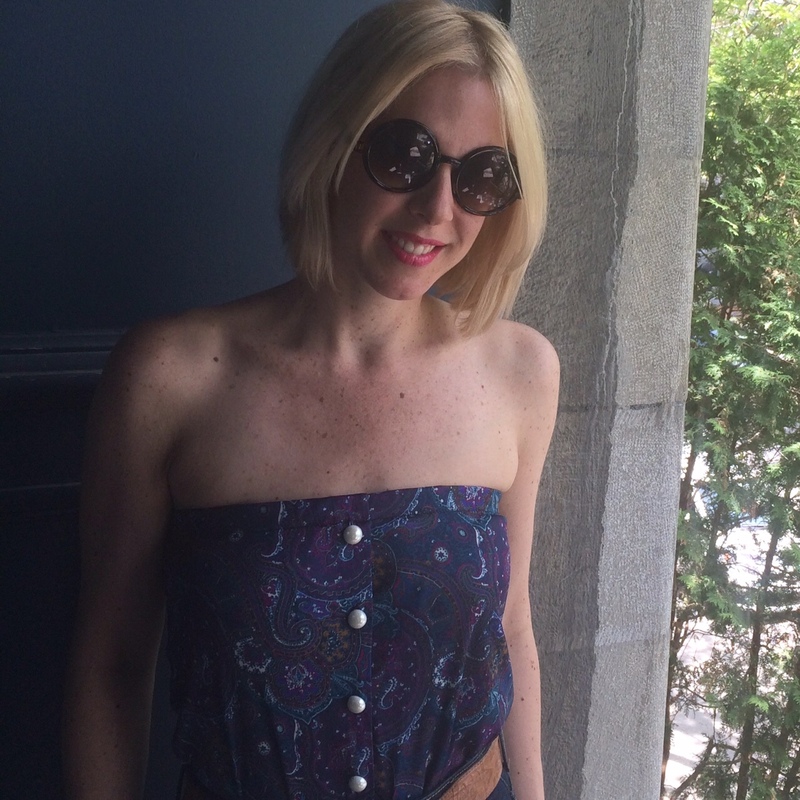 This dress was inspired by my recent makes with the Salme Kimono dress pattern. I love the silhouette of a kimono, however I wanted to design something that accentuated the curves underneath the clothes. I like the design of a kimono, particularly how the bodice and sleeve are a complete unit- one large piece. In true Tashenka style, I highlighted the waistline by joining the bodice and skirt portions at the true waist and cinching it nice and snug with an elastic band in a casing. I also have added short sleeves, my brother-in-law Jules calls them kimono cap sleeves. Traditional kimono designs have unattached sleeves, particularly in the underarm portion, however I reduced this draping look by redesigning the underarm portion in a more tight figure-hugging curve line down to the waist. And voilà, Tashenka’s Garden Party Dress. My sewing projects have been few and far between these past months. The holidays were filled with family and the post-New Year period filled with catching up with friends. Throw in some full time work and I’m left with very little sewing time. However, this sewing machine withdrawal period has allowed for some reflective moments- sketching some design ideas and muse on my muses. Where does inspiration come from? Everywhere. Most often, I find my inspirations when I’m amongst my friends, and this has always been evident with the company I keep. My girlfriends in particular, beginning with my own mother, have had a great influence on my past creations. This week’s vest creation is a nod to one of my nearest & dearest, Lady Veronika– a love-story of sorts. 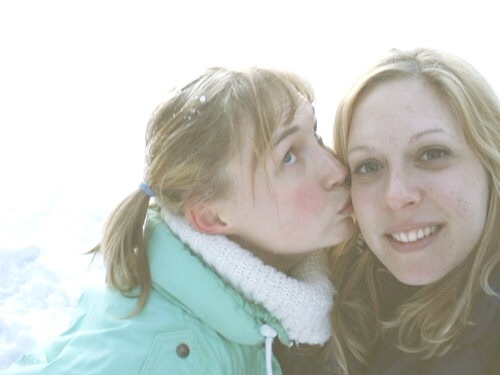 Veronika and I have been friends for nearly ten years now. I still remember the first time I saw her- she caught my eye with her stunning smile, killer dance moves as she sported this awesome retro vest. She embodied cool. My brother introduced us (at my request) to which Veronika smiled and grabbed my hand leading me on to the dance floor. I quickly began to understand that that gesture, confident, chic and cordial, was classic Veronika. All of which is reflected in her style. Her style has evolved over the years, as have her beautiful paintings, however her innate ability to always look elegant and classic yet utterly unique has never ceased. Maybe think Annie Hall mixed with John Lennon mixed with feminine eastern European style. That night Veronika had paired her oversized sheep skin/wool vest (her mother Danuta‘s I later learned) with a off-white lace trimmed blouse, paint stained blue jeans (she was in art-school at the time) and an eclectic mix of bracelets and rings. Make no mistake about it, this was love at first sight. This image of my friend inspired my latest upcycle project, making my own vest using faux fur. One of my recently found pleasures has been rescuing faux fur coats from the thrift stores, All under 15$, I have been salvaging and recycling the fantastic fabric of some great faux furs coats that I don’t believe will ever find homes again (apologies to those who would wear them as is). I drafted a pattern using an old nylon/down vest as a gauge and incorporated the original collar of the coat into my design. I removed the lining from a light gold Donnybrook faux fur coat, cut off the sleeves and separated front from back. I cut the fur and assembled it together. I sewed the bottom and arm hole hems. I’ll admit they look a little rough but I’m pretty pleased considering the improvised nature of this initial iteration. I also repositioned the hook and eye closures. I pair her with my plaid flannel or my floral polyester shirt, jeans and some Dior lipstick and voilà, my own version of the Veronika Vest!